West Bengal has clarified that they are not seeking claim over the dessert but only over 'Rasogolla. 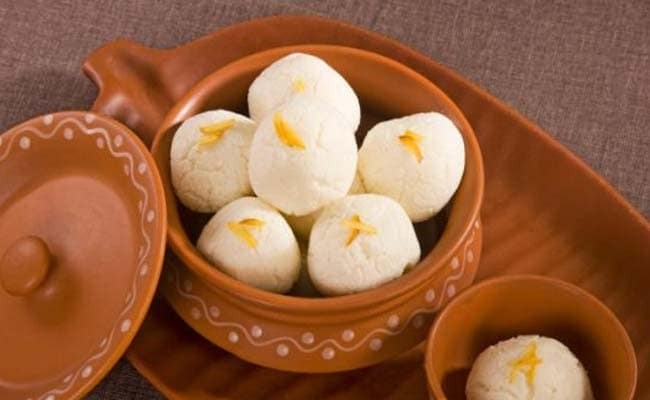 Kolkata: Amidst a tussle with Odisha over the origin of the famous sweetmeat 'Rasgulla', West Bengal has clarified that they are not seeking claim over the dessert but only over 'Rasogolla', a particular variety prepared in the state. Officials of the state science and technology department has clarified that they have sought Geographical Indications (GI) tag only for 'Rasogolla'. "There is no conflict with Odisha. What we want is to protect the identity of our Rasogolla. Their product is different from ours both in colour, texture, taste, juice content and method of manufacturing," an official told PTI. In a recent letter to the Geographical Indications Registry office in Chennai, the state department of food processing industries and horticulture said the way the dessert is made in the state is different from that of other states. "The preparation of light sugar syrup is unique and it contributes towards the taste of Rasogolla. Light syrup adds to the unique mouth-fill characteristic which is traditional in nature and well documented in different books unlike other similar products," the letter said, adding the quality of the dessert from West Bengal is unique. Even during its original application before the Intellectual Property office last year, the state government had sought the GI tag on what they call it as "Banglar Rasogolla" (Bengal's Rasgulla). "For example we have Darjeeling Tea and Himachal has Kangra Tea. Both are tea but the taste is different. Both can have GI tags," officials said. Odisha has claimed that the sweetmeat originated from the Jagannath Temple in Puri, where it is a part of the religious rituals since the 12th century. Odisha calls it 'Pahala Rasgulla'. In West Bengal, confectioner Nobin Chandra Das is widely known as the one, who created Rasgulla in the 1860s. Bengal has told the GI registrar office that the one in Odisha is a different variety. The Bengal one is off white or light cream coloured, spherical in shape while in other states, it varies from brown to other colours. "The concentration of sugar syrup is light while in Odisha it is highly concentrated. When taken in mouth, their Rasgulla is chewy and sticky unlike ours. The texture is also different. Ours is soft and foam type while theirs is hard and sticky," officials said. The geographical indication (GI) of goods acts as the "claim to fame" for a state. It identifies a product as originating from a particular location and conveys an assurance of quality and distinctiveness that is essentially attributable to the fact of its origin. Once granted, the GI tag prevents unauthorised use of the geographical indication and boosts exports by giving it a unique identity. 'Rasogolla', a dessert, made from ball shaped dumplings of Indian cottage cheese i.e "channa", is cooked in light syrup which is made of sugar. Officials said the sponge characteristics of the sweetmeat is linked with the human skill of sweet makers of Bengal. "People all over India and even outside the country know Bengal Rasogolla. It is very famous. We have around one lakh sweet makers all over the state involved in making it. Not only does our Rasogolla go outside the state but we also export it," they said.